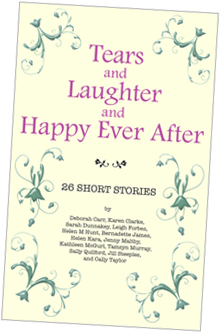 Tears and Laughter and Happy Ever After is a vibrant and varied collection of stories from writers who between them have had hundreds of short stories published in women’s magazines in the UK and around the world! Contributors have also won or been placed in dozens of competitions, published novels and written non-fiction for many UK magazines. As the title suggests, the twenty-six stories encompass the dizzying heights of happiness, the heartbreaking depths of sadness and every emotion in between. Within the pages of this book you’ll meet a housewife with a surprising secret, a beekeeper with a problem and an undertaker with something unusual on his mind. You’ll also encounter angels, ghosts, aliens and many other intriguing characters. And, in the end, you may just find the path to happy ever after. The idea for this book came from the successful ‘A Story A Fortnight’ writing group which brought the writers involved together in a project that has inspired and supported them in their short story writing. Who’s been up to ‘Monkey Business’? What’s happening in ‘The House At Summer’s End’? Who is ‘The Girl In The Yellow Dress’? If you want to know, you have to read Tears and Laughter and Happy Ever After. What a great idea – the best of luck with this. Thank you! It’s been a hugely exciting project so far. Wow! You girls are amazing. It will be downloaded onto my Kindle before you know it! Lovely site,love the green motifs. All the very best of luck with your project. Thanks very much Alison, we’re really pleased with it! Can’t wait to have a copy! Good luck – I’m sure it will do very well. Thanks a lot. We’re all really excited. HI All – I’ve popped the link banner on my craft blog – might help out. Haven’t got an e-reader though…unless I read on my PC? Thanks Vicki. So pleased to hear that you liked it! Be the first to hear about our news, competitions and special offers!